Sell Me a Suit, Cut off my Hair and Send Me to Work in Tall Buildings? NOT! A hot saturday afternoon of playing tunes and guitar, and a slew of photos arriving in my Google+ inbox reminded my of an old John Hartford elegy, “Going to Work in Tall Buildings.” For those who may not remember, John was the accompanist to Glen Campbell in the Goodtime Hour about 40 years ago, during my “formative” days. This is a mild exhibit of Hartford’s subtle subversive nature. A person (a recently discharged marine) I met a few weeks ago in Missoula as he was hitchhiking across America to the Occupy Wall Street demos, finally arrived and will be feeding some live updates back. His photos as he entered the Wall Street district were foreboding. I hope he sends me more good stuff, so I can give folks a street-level view of the happenings. These are the the tall buildings where the raveling and unraveling of our financial system’s catastrophes takes place. This is where the people that control the fate of our country’s political and economic future might clash. But just maybe it won’t be those that live and work in tall buildings that get to make the final determinations on our future. Maybe it will be those who take to the streets, and eschew working in tall buildings. Those barons of finance might do well to come down out of their gilded towers and do some socializing with the rabble down below. Otherwise, they may find that their president–and maybe their next president–can no longer stand between the pitchforks and the doors barring entry to tall buildings. Tax the Rich, Feed the Poor? 40 years later, it all still makes sense (at least to this old hippy). Alvin Lee — once known as the world’s fastest guitar player — has always been one of my all-time favorite guitarists! ’nuff said ’bout labor day… Enjoy! Continuing on with our celebrating the 20th birthday of the WWW, I found this interesting nugget as I perused the webiverse today. As a web developer, I have had a particularly bad opinion of Internet Explorer over the years, as it always takes some extra hacking to make it surrender to the open standards that control how web pages should be written and displayed on the web. Now I know why so many people just don’t upgrade to a browser that works better. Maybe the saying “the browser of the Tea Party” when referring to IE has some substance to it! This report also suggests that Microsoft, the company that authors Internet Explorer, has good cause to advise its customers to upgrade from IE 6. Maybe it’s because the company realizes that extended use of IE has a negative effect on its customers. But more likely, as Microsoft’s “Friends don’t let Friends use Internet Explorer 6” campaign reveals, it’s because MS understands that more intelligent people are migrating to Firefox, Google Chrome, and Apple’s Safari browsers, and it’s only solution to retaining market share in the browser wars is to get people migrating to its most recent version, which happens to be more copacetic with internet standards than its previous versions. If you’d like to read the study yourself, head on over to AptiQuant (and please don’t let their disclaimer dissuade you from reading the report, it’s worth it! ;-) ). Happy 20th Birthday, WWW — Click on Me Baby, and I’ll Hyperlink to You! –The computer that created it all, including coding and hosting the first public web server, coding and surfing the net with the first web browser, and editing the first web page. And that computer? It’s a NeXT, the computer company that Steve Jobs founded after he was ran out of Apple in 1984. August 6th, 1991. The day it all started with the first public-facing webserver going live. Or maybe for some, it was the day it all began to unravel. Most likely I spent the day harvesting raspberries by the gallon from the quarter acre patch I had. The idea was to connect hypertext with the Internet and personal computers, thereby having a single information network to help CERN physicists share all the computer-stored information at the laboratory. Hypertext would enable users to browse easily between texts on web pages using links. The first examples were developed on NeXT computers. Berners-Lee’s first concept for the web was called “Mesh.” As you can see in the drawing below, the first concepts of the WWW were no better than the doodles I was making while daydreaming in grad school at the time. But who would have known in 1989 that this drawing and the proposal that was drawn up for CERN would presage as radical of a change in mass media communications as the original printing press, or radio, or tv, or… iPad? With apologies to Weird Al. I submit that when liberal and/or progressive blogs join that media narrative of how the Democrats should be able to *do* something about the Republicant intransigence, they reinforce the voter idea that ‘might makes right’. It’s a twist such that Republicants, instead of looking like the saboteurs of the American dream that they are, end up looking like the strong leaders, and Democrats are again punished for not joining in the right-wing pogrom against the common folk. 4 & 20 is certainly not the only website to join in that insane chorus. But insane it is. jhwygirl’s post and many comments to it paint the same picture. Who the f*ck cares if you think we don’t understand the world the way you do?!!! Well, lizard opened a can of worms with his post below about the Rainbow Gathering coming up soon in Washington. Which reminds me of a little event going on this weekend put on by some sort of non-affiliated local conglomeration of rainbozos called Rainbow Productions. Seems that Missoula is going to get either a wonderful cultural treat, or something for hippy-bashers to wring their hands in glee over. Open thread for this glorious, rapturous spring day! I’m not going to break the big news–we’re going to leave that up to Pete whenever he shows back up, but 4&20 has many reasons to celebrate, and I hear there may be a flock gathering somewhere’s about town tonight. And I don’t want to mix that up with the other reason I have to write this. So I’m going meta here. I left out all of the insults and BS that led to my pulling the comment. But the gist being that because some of us write outside the mainstream, and have the temerity to criticize the center, that we are negatively affecting this site’s readership is just wrong. And that sort of commentary coming from someone whom used to be more widely respected in the Montana blogosphere attacking our credibility and readership needs to be answered. And because it was I, mostly, who have inspired this angst in our critic from the center, I don’t want to leave it up to jhwygirl or Pete to defend the site from my opening my mouth (or typing stream-of-thought, which is what I do). I’m a big boy. I can take my lumps and punch back. And I hear it when some people say I have been less than sociable in my discussions–I know when to say mea culpa and not be so blunt in the future. The last quarter, Q1 2011 saw a rise in page views of 12% over Q1 2010, and 36% over Q4 2010! And lest we think quarterly results may not be the best marker, a look at this April’s numbers show us on track to have a 27,000 page view month. To put that in perspective, we have only had 2 27,000 page view months in the last 2 years. So clearly our writing is not negatively affecting our viewership. Not that that doesn’t keep some from trying to intimidate writers here into keeping silent, and running them off of other blogs. This attempt to stifle dissent and over-the-top bullying and abusive approach to trying to control the blogs, in the words of some is “troubling.” But it has gotten me to thinking of the role of the dissident and the critic–criticizing the mainstream from the fringes– in today’s society, on which I may have more to write in the future. You mean people like you, Rob? end days? aliens? or are blackbirds just giving up? Mothership Touches Down in Eastern Montana! 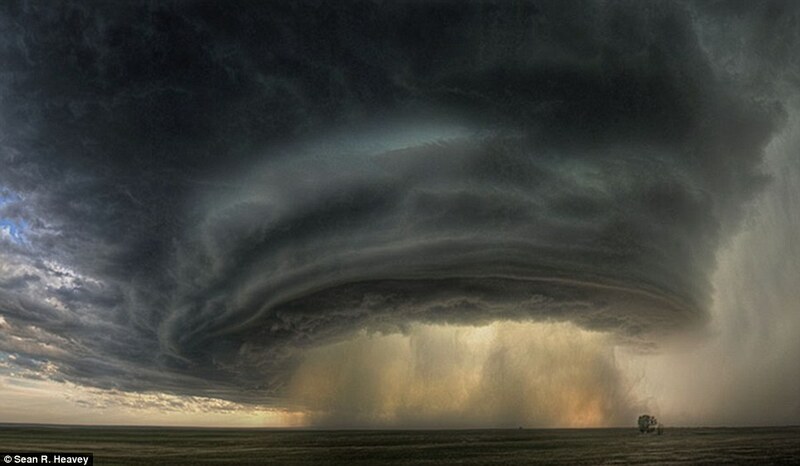 Mesocyclone photo by Sean Heavy of Glasgow is part of the NatGeo’s annual photo contest. Slow day at the office… Enjoy! It’s been a while since I’ve put up a new piece of Blackbirdabilia, but I came across a nice ditty from Silly Wizard tonight as I was perusing the more obscure corners of my iTunes library. I ran across this great tune, as I was listening to some songs I had learned years ago. This version is sung from the man’s perspective. There also is a females’ version that is quite lovely. http://www.artandimage.biz/media/Oud-Improvisation.mp3 “Oud Improvisation” by Naseer Shamma, from the album The Fire This Time. “If you eat asparagus, or if you start your meal with soup and end with dessert, or if you use toothpaste, or if you wear your hair in bangs, you owe a lot to one of the greatest musicians in history. Life is too short to just sit around and argue politics all the time. So sit back, play the music, read the story of Ziryab, and enjoy. Blackbirdabilia at its best: obscure, yet enlightening! For this week’s viewing pleasure, I bring you “Barack Meets The Birds“, a slightly anachronistic, out-of-time mashup of Hitchcock’s thrilling masterpiece. Next up in our ongoing series is Blackbirdabilia #2: Stephen Stills at the Big Sur Folk Festival, September 14th, 1969. This clip is taken from the documentary, Celebration at Big Sur. This was one month after Woodstock, and in honor of its 40th anniversary, I thought you might enjoy it. I first listened to Stephen Stills live in 1974 in Tempe Arizona, playing with some sidemen by the name of David, Neil, and Graham. Here to start your week off bright and early, we bring you our first edition of Blackbirdabilia, Paul McCartney singing his song “Blackbird.” Enjoy!